There’s nothing better than heading outside to your local public park to find a TURF field so that you can get some physical activity in for the day. If you are unfamiliar with turf/football/soccer field workouts to do, then this article is here to help. These types of “green” field workouts are mainly going to target working your cardiovascular endurance, not strength and resistance training. Very minimal equipment is needed to complete most of these drills, which makes them an easy switch-up from your regular cardio routine. Lists of exercises are listed below. Additional information with specific subcategories to these workouts and instructions on how to do them is also provided for extra insight! Agility Ladders: Great for improving your footwork! If you have a ladder just lay it down on the turf and get started. Go through the ladder and then run back to the start. Try to complete 6 rounds of each specific drill. These are just a few but many more are listed online! One-foot in: Run through the ladder with only one foot in each square at a time. Two-feet: Run through the ladder with stepping two feet in each square. Lateral side shuffle: Face one side and step your leading foot into the 1st square, directly followed by your trailing leg. Two feet in each square all the way down the rest of the ladder. Alternate which side to start on each time. Zig-Zag: Start on left side of the ladder. Step right foot into the 1st square. At the same time your right foot steps outside of the ladder, your left foot then steps into that 1st square. Now bring your left leg into the 2nd square. At the same time your left foot steps outside of the ladder on the other side, your right foot then steps into that 3rd square. Complete all the way down the ladder in a zig-zag fashion. 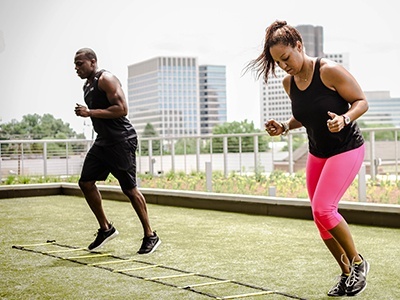 Single-leg hops: On one leg, hop down the ladder landing lightly in each square. Switch sides each time. Walking push-ups: In a plank/push-up position, have one hand in square 1 and 2. Push-up and then walk laterally down the ladder. Lead with your right hand for one set, then face the same way coming back to have your left hand lead back! Cone Drills: Excellent for improving cutting, quickness, speed, and velocity! X-Drill: Set up the cones in a square. Start at cone 1 (bottom left corner). Sprint diagonally to cone 2 (top right corner). Cut and sprint to the left to cone 3 (top left corner) and then sprint diagonally to cone 4 (bottom right corner). Repeat for as many rounds are you want. T-Drill: Place 4 cones in a “T-shape.” (3 cones in a line laterally, and 1 cone vertically behind the middle cone). Start at cone 1 down at the bottom of the “T”. Sprint 5 yards to cone 2 in the middle. Shuttle 5 yards to the right to cone 3. Shuttle 10 yards all the way to the left to cone 4. Shuttle to the right 5 yards to cone 2 (back in the middle). Finally, back peddle to cone 1. Repeat. 3-Cone Drill: This drill is primarily done in the NFL combine. It is an awesome way to test your body control while changing direction at a high speed. Set up the cones in an “L-shape.” At the top of the “L” (cone 1), sprint as fast as you can to cone 2, which is the bottom of the “L”. Cut quickly and sprint back to cone 1. Cut again and run back around the outside of cone 2 to cone 3 (parallel to cone 2). Weave inside then outside of cone 3, to the outside of cone 2, and then all the way to the start at cone 1. Make sure to time yourself and try to beat it each time!